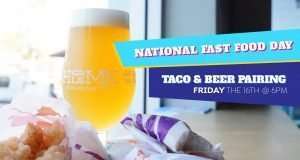 Taco Bell Items paired with delicious Home Brewing Co beers. Curated by Owner George Thornton (Cicerone and National Beer Judge). Join us for a fun filled garbage food eating experience. This is the best of all of your worlds colliding like a non-accidental acid trip through all those times when you thought you were hoity-toity, but come on, we all just really want some Taco Bell.